When David Cameron announces that ISIS must be defeated by “hard military force”, we can finally be certain that history teaches us nothing. Or, more accurately, it teaches only that which we want to learn. We British are experts at this. In our culture history is mostly understood through the Second World War: Hitler, Churchill; The Battle of Britain and The Blitz. The story is told over and over in a thousand different ways. It’s a pre “Tall Boy” tale, of terrible battles between good and evil. There is truth in it, but it is also dogma. It smothers unsettling thoughts of Empire, both its pomp and collapse. Too often this history becomes an excuse for the export of violence. It paints over complexity and creates a black and white image of battle, where individuals are smudged into a distant swarm, and given collective enemy names: “Jihadists”. “Butchers”. “Isis”. The language morphs a dizzying variety of people, circumstance and worldview into one single, drooling monster wearing a Hitler mask: Slay the dragon. The leaders of Isis are busy creating their own history: of a holy land exploited by rapacious white men and puppet tyrants; of a cleansing mission passed down by God. The tale is built on rubble: Palmyra shows how determined the movement is to eradicate what doesn’t conform. One book, one history, one people, is the driving force. No confusion, no questions. Strength through brutish myopia. Air strikes are no solution to their war. Cameron knows this, but hasn’t the capacity to imagine other options. It’s hard to blame him for that – he’s the latest PM to follow the old Yes Prime Minster adage: “Something must be done; this is something; therefore it must be done.” Nevertheless, there are options. The first alternative is to stop interfering all together: get aid to those who need it, help refugees, and leave it at that. This approach has its attractions, but fails to tackle those people (about the only useful collective description is that they are all people) – who are actually fighting for Isis. Finding a way to tackle their reductive quest, outside of drone assassination, is difficult but not impossible. There is perhaps, one option. We need to drop books on Isis camps. Millions and millions of translated books – carpet the fields, streets and hills. We can buy 20,000 for the cost of one of the RAF’s Brimstone missiles. Make the books pocket-sized, easy to secrete in a jean pocket or kit bag. Ensure that it is fiction, only fiction, and maybe poetry and comic books too. Select writers from all over the world – not only Iran, Iraq and Syria, but Brazil, China, India, Russia, Kenya and Britain too. The worst fighters can do is burn them. At best, one or two from every ten might sneak a copy out, read in some snatched moment. They might find comfort, excitement, enlightenment in the pages, and ideas beyond the new Isis history. That, surely, is the best hope we have of them dropping their weapons, and seeking something else. I would certainly argue to include some science fiction in the drop. No other genre so effectively opens minds to the idea that change is inevitable, reality tenuous, and the future under constant threat from those of us living in the past. 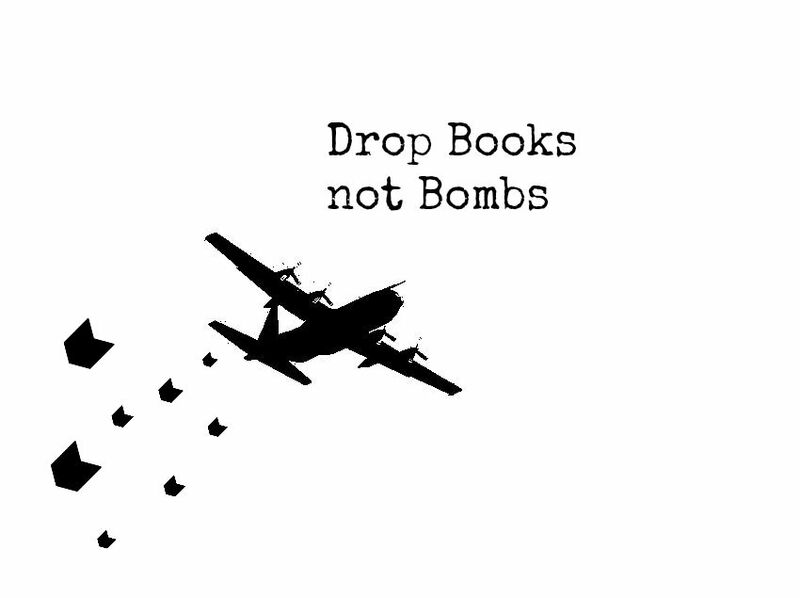 “Books not Bombs”. It sounds like mad lefty clickbait. But it’s clickbait I can believe in. And it can’t be any crazier than scrambling the fighters again – can it? Note: After writing this I googled “Books not Bombs” and discovered the education campaigning of people like Nobel laureate, Shirin Ebadi and Pakistani activist, Malala Yousafzai. Worth investigating. I also discovered a lot of t-shirts. Second note: We can also drop ipod shuffles – loaded with audio books. Oh, and music too: Mozart, Beatles, Ali Farka Toure, Miles Davis, Buena Vista Social Club, Ravi Shankar. Whatever you like. Music elates and transports as effectively as books, right?